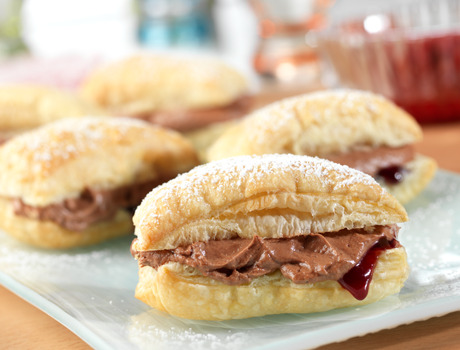 These mini Napoleons are perfect for a dessert tray or for afternoon tea...but you'd better make plenty...the rich chocolate raspberry filling is hard to resist. Unfold the pastry sheet on a lightly floured surface. Cut the pastry sheet into 3 strips along the fold marks. Cut each strip into 6 rectangles, making 18 in all. Place the pastry rectangles onto baking sheets. Bake for 15 minutes or until the pastries are golden brown. Remove the pastries from the baking sheets and let cool on a wire rack for 10 minutes. Split each pastry into 2 layers, making 36 in all. Place the chocolate and milk in a large microwaveable bowl. Microwave on MEDIUM for 30 seconds. Stir. Repeat until the mixture is melted and smooth. Let cool to room temperature. Beat the cream cheese and confectioners' sugar in a medium bowl with an electric mixer on medium speed until the mixture is smooth. Beat the cream cheese mixture into the chocolate mixture. Fold in the whipped cream. Spread about 1/2 teaspoon jam on each bottom pastry half. 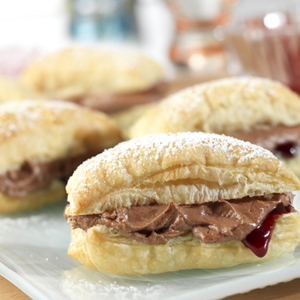 Divide the chocolate mixture among the bottom pastry halves and top with the top pastry halves. Refrigerate for 30 minutes. Sprinkle with additional confectioners' sugar before serving. Tip: You can serve these Napoleons with this raspberry sauce: stir 1 bag (12 ounces) frozen raspberries and 3 tablespoons sugar in a medium bowl until the berries are defrosted.